Process for the cleaning with solid carbon dioxide (CO2, see Dry ice). The dry ice blasting method can generally be used for removing any type of material exhibiting intense reactions to temperature differences, such as oils, waxes, separating agents, but also paints, varnishes, adhesives, bitumen and plastic deposits. These can be readily removed without any damage to the surface. Since dry ice blasting is considered to be non-abrasive, it is particularly suitable for gently cleaning molds and casting tools of any kind (e.g. gravity dies, core boxes, die casting molds, etc.). In the dry ice blasting unit, the dry ice pellets (Fig. 1, ASCO Kohlensäure AG) are accelerated to a speed of approx. 300 m/s by means of compressed air and impinge upon the object to be cleaned, creating a point thermal shock. This causes the covering to be removed to contract and detach from the base material. The resulting kinetic energy removes the covering. Upon impact, the dry ice pellets immediately transition to the gaseous state (sublimation), leaving a dry surface. What remains is the detached coating or impurity, and there are no abrasives that need to be disposed of. As the pellets have a hardness of only approx. 2 Mohs, the surface quality is maintained and not damaged or altered (Fig. 2, ASCO Kohlensäure AG). Gentle: in contrast to conventional blasting methods using sand or glass beads, the cleaned surfaces are not damaged or altered. As an example, closing surfaces in gravity dies are not rounded, avoiding burring to occur. 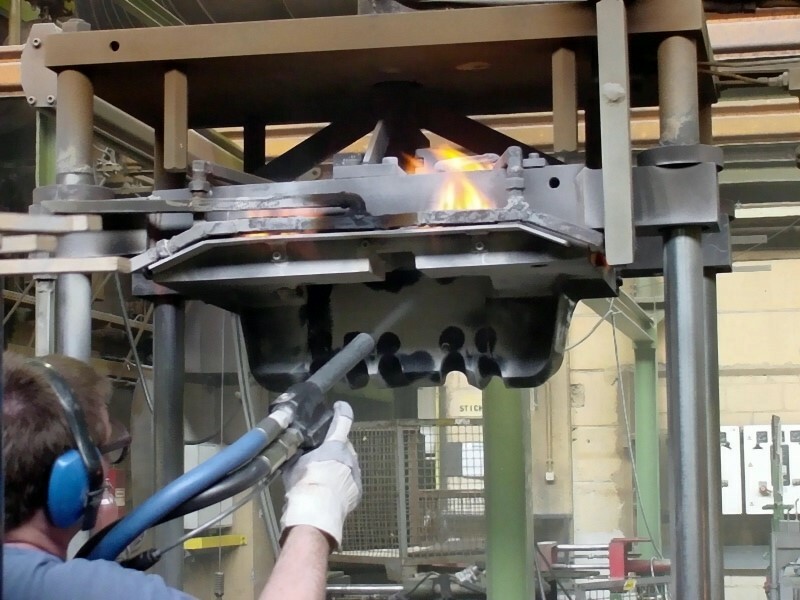 No dismantling: the process can be applied directly to the molds/systems. 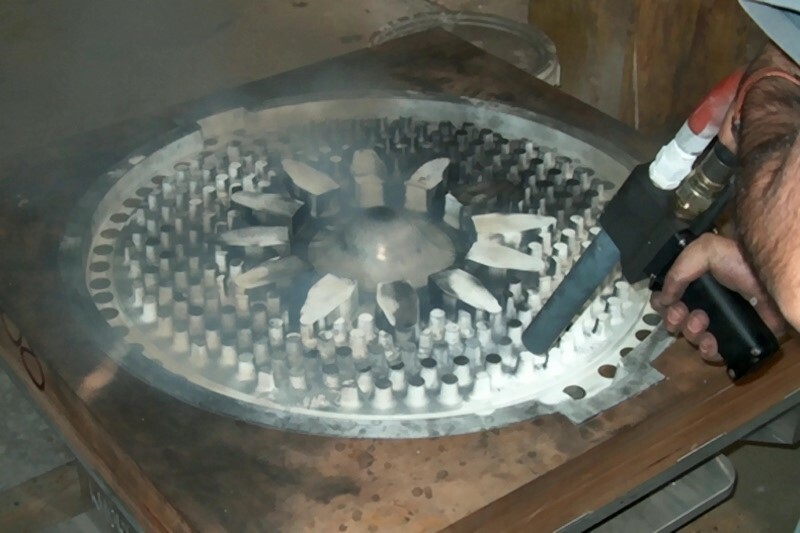 Even hot gravity dies can be directly cleaned using this process without a noticeable cooling effect so that production can be resumed immediately after cleaning. 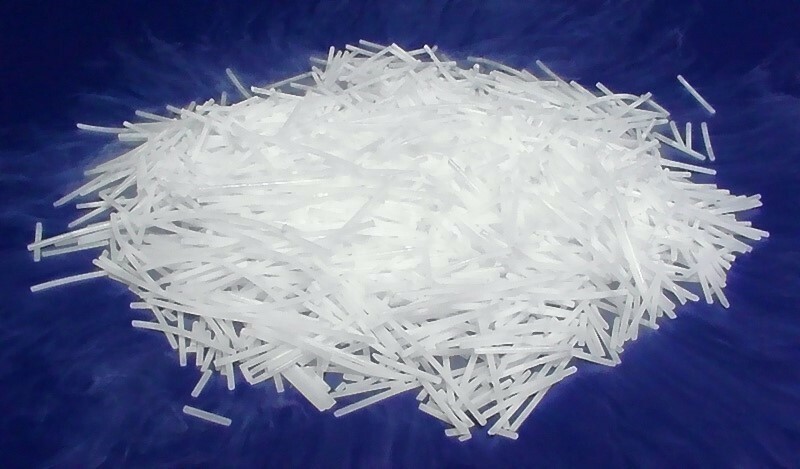 No blasting material residues: since the dry ice pellets immediately evaporate upon impact on the surface, there are no abrasives requiring disposal after cleaning. 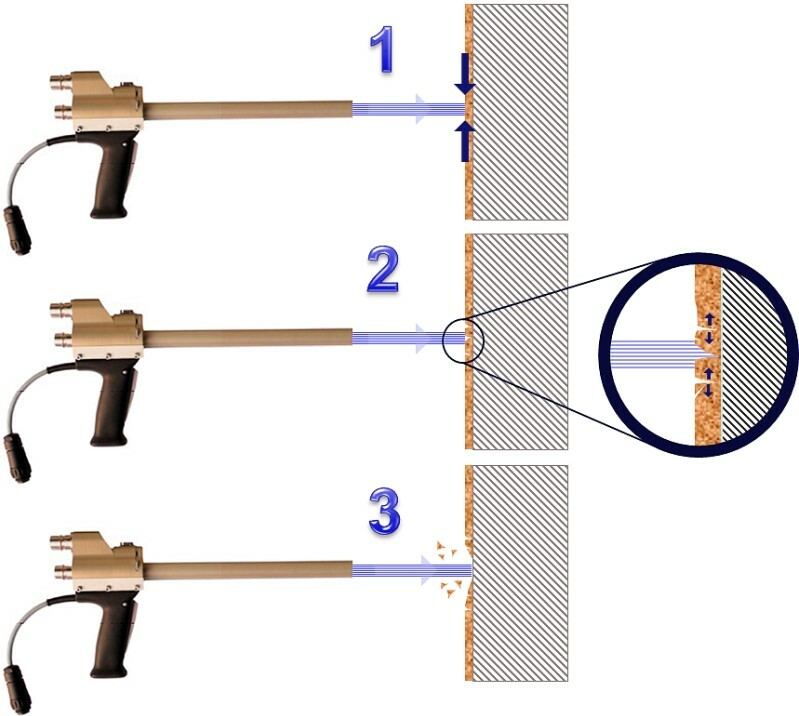 Examples for the application of dry ice blasting are shown in Figs. 3 and 4 (ASCO Kohlensäure AG).